Cardiff City preview 2015-16: Can Slade contend for promotion? For the first time in four seasons, Cardiff City start a campaign in a blue strip. Now it is up to Russell Slade and his squad to lift the post-relegation blues which endured last season. Even with the support of owner Vincent Tan, the affable Slade is in one of the most pressurised jobs in the Championship. The way Cardiff cope with a tough looking opening group of fixtures may give us a decent indication of how much that pressure will build. For the most part it was absolutely dismal, an immediate return to the Premier League never looked remotely possible. But there were signs of improvement towards the end. Ole Gunnar Solskjaer's frenzied recruitment resulted in a squad of quantity, not quality. He departed after just nine games. Slade, lured from League One side Leyton Orient, was the unexpected choice of Vincent Tan. A section of Cardiff fans remain sceptical - though his main drawback initially appeared to be his name was not Tony Pulis. Slade brought a degree of stability at a club where that is often in short supply, while instigating the owner's austerity measures in slashing the wage bill. Sometimes it was not pretty. But January's return to playing in blue removed a hugely divisive negative, Paul Trollope's arrival on the coaching staff seems inspired and Cardiff's late season form brought an 11th placed finish. The unveiling of their new blue kit this summer, brought the most positive reaction from fans towards the club since promotion to the Premier League. Now there is some sort of reconnection, the Bluebirds players need to inspire the supporters and use the fervent backing to help make the Cardiff City Stadium a fortress, as it was in the Championship title season of 2013. The loss of goalkeeper David Marshall - linked with West Brom - would be a real test, but at least Cardiff have defensive depth and no little ability in the impressive Bruno Ecuele Manga. An influential Peter Whittingham would be a real boost, particularly for striker Joe Mason. If Anthony Pilkington and Kigasho Dikgacoi can remain injury free, Cardiff have a sound base. A good start seems essential, not least for Slade to convince the doubters he can cut it at this level - and keep owner Tan sweet. If Cardiff can be challenging in January, the fans will hope the lucrative lure of the new Premier League television deal to start next season will encourage Tan to loosen the purse strings in the winter for the final push. But as Solskjaer and Malky Mackay found - for different reasons - getting to the new year is not a given for a manager. The Championship is a famously tough division. But Cardiff fans will demand their team are in contention towards the end. It's a huge opportunity for Joe Mason. 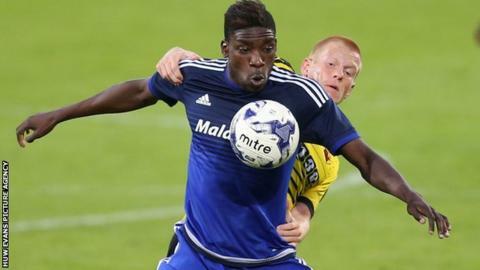 After three loan spells at Bolton he now has the opportunity to call Cardiff City home once again. Mason seems to be the focus of the Cardiff attack and has the intuitive movement and cool finishing ability to prosper. Fingers crossed he avoids injury and Whittingham can supply him with plenty of ammunition..
Simon Moore may have to step out of the considerable shadows of David Marshall and with (hopefully) the Euro 2016 finals to think about it would be great to see Wales international Declan John find his best position, get a chance, and fulfil his obvious potential. A roller-coaster, headline-grabbing ride with plenty of distractions - it is what we have come to expect at Cardiff by now. They still need attack and midfield reinforcements before this window shuts, but the squad is fitter, better organised and seems relatively settled. Play-offs have to be the aim but they probably need to strengthen to secure that. Championship: 8th. FA Cup: Fourth round. Russell Slade: "Our aim? It will be top six despite the ins and outs and whatever goes off. We're trying to keep the group really tight that we've got and we know we can focus on and move forward with and that's important for us. We can't allow anything else to distract us. "I think we're all on the same page now and we know what's required. "I'm optimistic, but I think I am that by nature. If we can build on where we were last season when we were in the top six over the last 10 games we have to progress from there, and if we can then the future is going to be bright for the football club." Former Wales striker and BBC Wales pundit Iwan Roberts: "To finish top six, I think it is a tall order. You feel for Russell Slade because they haven't got millions to spend, they're going to go in a different direction. "I think the players have to take responsibility; you can't always hide behind your manager. You need big personalities in that dressing room. "I think they are good enough though, they've got good players, players who've played in the Premier League."